More than 100,000 people in Metro Vancouver are working, but still living below the poverty line, according to a new study. The Canadian Centre for Policy Alternatives released a report Wednesday that delves into census data from 2012 on income and employment. 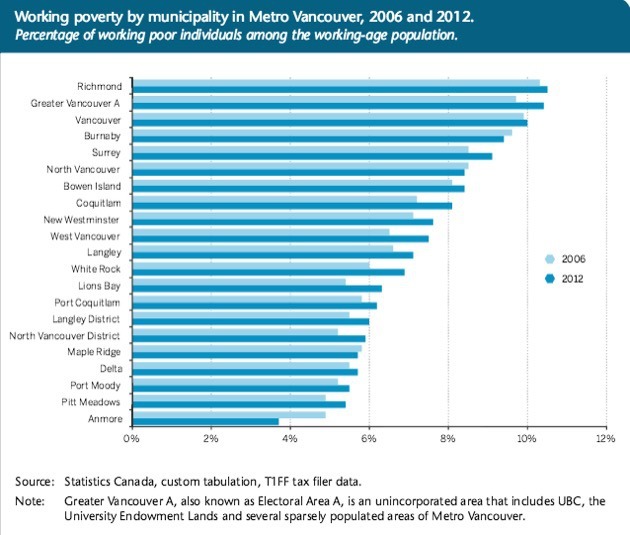 It found that 8.7 per cent of Metro Vancouver residents who were of working age had jobs but were still poor. That was up from 8.4 per cent in 2006 and only slightly below the area with the highest percentage of working poor in Canada: Greater Toronto. Some of the largest cities, including Vancouver, Surrey, Burnaby, Richmond and Coquitlam, have some of the highest working poverty rates, but the study found that several smaller municipalities — Greater Vancouver Electoral Area A (which includes UBC), Bowen Island and North Vancouver — had high levels as well. The lowest rates were in Pitt Meadows (5.4 per cent), Port Moody (5.5 per cent), Delta (5.7 per cent) and Maple Ridge (5.7 per cent). The largest increases from 2006 to 2012 were in West Vancouver (15 per cent), Coquitlam (13 per cent), White Rock (15 per cent), Lions Bay (17 per cent) and the District of North Vancouver (13 per cent). “We are often told that the solution to poverty is for the poor to ‘get a job’ or for various sectors to create more jobs, but the reality is that having a job is not a guaranteed path out of poverty,” the report said. It suggests poverty in B.C. arises increasingly from the low-paid, part-time and temporary jobs that have been created since the 2008 recession. As for solutions, the report urges the provincial government to boost the minimum wage to $15 an hour, strengthen employment standards, and invest in more social housing.